By now the story of Hedy Lamarr having invented the technology that would become the basis for all cellular phones, smart phones and defense department guided weapons systems should be common knowledge. What? You say you didn’t know that the Hollywood Goddess was also an inventor? That’s right, Hedy was pure and simple, a genius. Not only that, but she knew a thing or two about science and military weaponry. That’s because before she came to Hollywood and shined on the silver screen, she was married to a wealthy arms merchant who sold weapons to anyone who could afford them. And the highest-selling weaponry, then or now, was the latest, greatest bomb, bullet or torpedo that could not be stopped! Enter, Hedy Lamarr’s invention. Put plainly, Hedy had the idea of creating a guidance system based on a broad-spectrum technology, one in which the frequency of the signal for said bomb, bullet or torpedo would change in sync with the system guiding it. So, if both the gun and the bullet having shot it are in sync, the signal sent and received changing frequency every second or so – it would be impossible for an outside force to disrupt that signal. Now think that a movie star invented this technology in the early 1940’s and you’ll begin to understand the importance of Hedy Lamarr’s discovery. Now here’s the sad part of the story. Hedy patented her cellular technology but it lapsed before the military application fully took hold – after World War II. Even more distressing was the commercial application of the technology, found in every cellular and smart phone walking around today. By rights, Hedy should have been a billionaire several times over by the late ’90s. Instead she was broke, and no one cared that the woman who once was one of the world’s most beautiful and sought after movie stars had been ripped off for an invention that would change the world and make telecommunication companies the monsters they are today. Dear Hedy is gone now, and the story I just told you is yet to become common knowledge. She was recognized for her invention late in her life by a field of appreciative scientists, if not the corporate honchos who made billions of her invention – and still do today. But what I’d like to remember Hedy for was the beauty and brains who dared to think outside the box and, in her own way, help democracy and freedom spread throughout the entire world. See, it’s not always the one invention that changes the world, but all the applications, ideas and subsequent inventions that come after it. 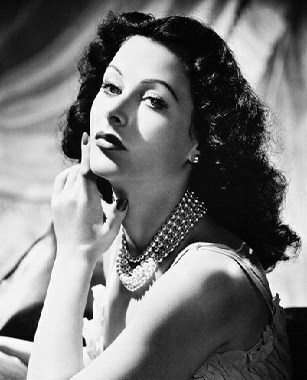 Hedy’s revolution in cellular technology paved the way for a lot of the gadgets we rely upon in our daily lives today. And while we may still admire her beauty in movies such as ALGIERS and WHITE CARGO, the Hedy I really admire is the little bit of her that fits into the palm of my hand. The one who dared to use her brains in addition to her beauty and changed the world forever.